There are lot of ways to think about deck construction for Aventuria, especially given the huge variety in the heroes themselves. 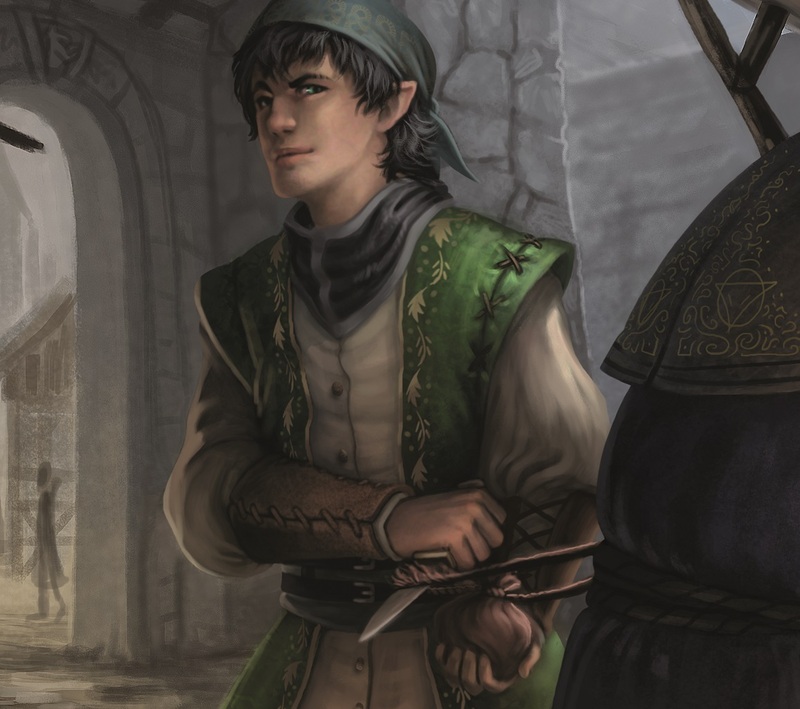 To help you get started, today I’ll be focusing on just one hero: Carolan Calavanti, the Half-Elf Rogue. (Or, if you prefer, Rathelia Ricottini.) As with the article on Endurance, many of these concepts can easily translate to other heroes. The most important question to consider when starting your first custom deck is – what does this hero do that other heroes can’t? Your deck will be more effective if you build around the strengths of the hero itself. This gives you a Dodge of 11 with a free reroll every turn plus two emergency Dodge boosts. This is absolutely worth 8 cards, since it is the core of the deck. Treasure Hunt, Connections, and Foul Play are all good at cycling cards. Foul Play in particular is unique as it is the only way in the entire game to recover an Endurance card that you have played. That one is probably worth holding onto. The other two may not be as useful in a more focused deck with a lot of duplicates, which is what we’re building. They can be used to interesting effect with Self-Sacrifice with a specific strategy where you just build up a huge hand and then drop the entire thing to kill your opponent in one fell swoop. If you want to build that deck, grab all the other card-drawing mechanics and try it out. But it’s definitely not the deck we’re building right now. And for the healing effect, I would rather just put in a second Healing Potion so that I don’t have to burn cards from my hand. Taunt is a card I rarely use. It’s good early on to slow your opponent down, but the 2 cost also means you’re likely slowing yourself down. I am rarely willing to take that tradeoff. Every once in a while you might be able to time it just as your opponent is getting out the big expensive weapon or spell, but that’s hard to guarantee. Note – There is just one card in this deck that you will need to get from expansions: the extra Vigilance (from Tjalva’s deck). If you only have the base set, you can replace that with either Danger Sense or Self-Sacrifice to help your overall survivability. Most of the extra cards I’ve selected come from Layariel’s deck, and a few of them come from Mirhiban’s. And as always, make sure that you are paying attention to the card limits. (The Construction Charts are now available on the Downloads page.) If you keep a balanced spread of card types, you’re unlikely to run afoul of these limits too often, but they exist to keep you from putting together a deck that is too focused on one thing. Have fun, and watch out for the Irrhalk! With Reward Cards, you can have over 30 cards during a multi-chapter adventure, but that is the exception. Otherwise your deck must be 30 cards. What kind of modifications would you recommend to this deck for Adventure Mode? Depends on whether you’re doing solo or cooperative. Disguise is actually really great in cooperative, so I would keep it around, but dump in solo. You might also drop Pickpocket in favor of one of the other card drawing cards, but it’s still pretty good. Self-sacrifice might want to come back in with cooperative. Yea I usually play with 2 or 3 heroes. Actually playing with 3 has been ideal for me so far. Anyways, thanks for the tips because for some odd reason I’ve had some difficulty figuring out a good deck Carolan that I like. With disguise, should I have 2 copies? Yea I’m currently using Pick Pocket but haven’t really used it much in coop. What alternatives do you recommend? Outside of adding in Self-Sacrifice, is the rest of deck you have listed here seem good? I do like the idea of building around his dodging ability. I for sure like building character decks that are focused. Are there any other cards that might be potential prospects to build a deck around for Carolan? Thanks again. I just bought the game and completed the base box adventure. I’ve really enjoyed. Cheers! A second copy of Disguise is strong, but you can’t do that out of the base set. You could do it if you picked up Arsenal of Heroes. Connections is another option to swap in if you find yourself in mid-game with a lot of unused Endurance. 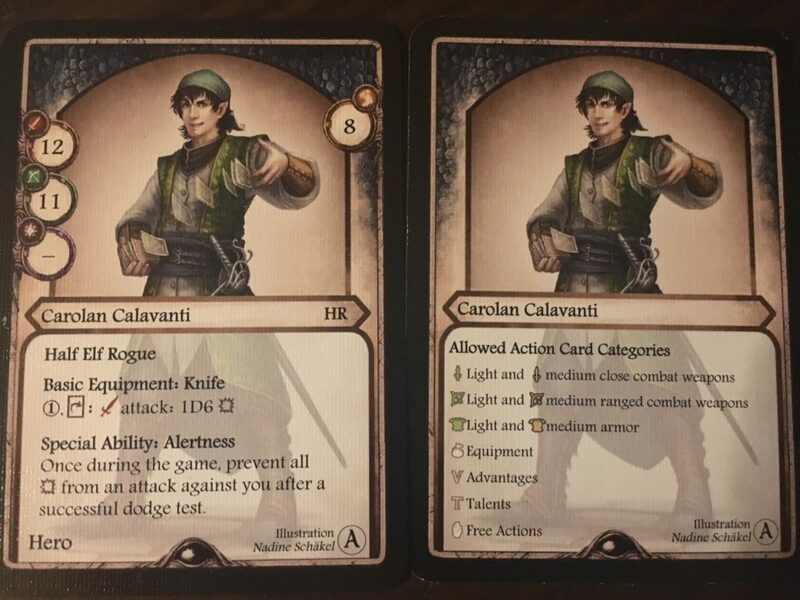 If you’re going to focus Carolan some other way, I would use all of his card-drawing abilities on himself to get the best weapons he can get plus attribute bonuses and poison. Then attack twice per turn with both ranged and close. At that point, you’re relying more on his inherent survivability to get you through, although you’d still want some armor and dodge boosting. 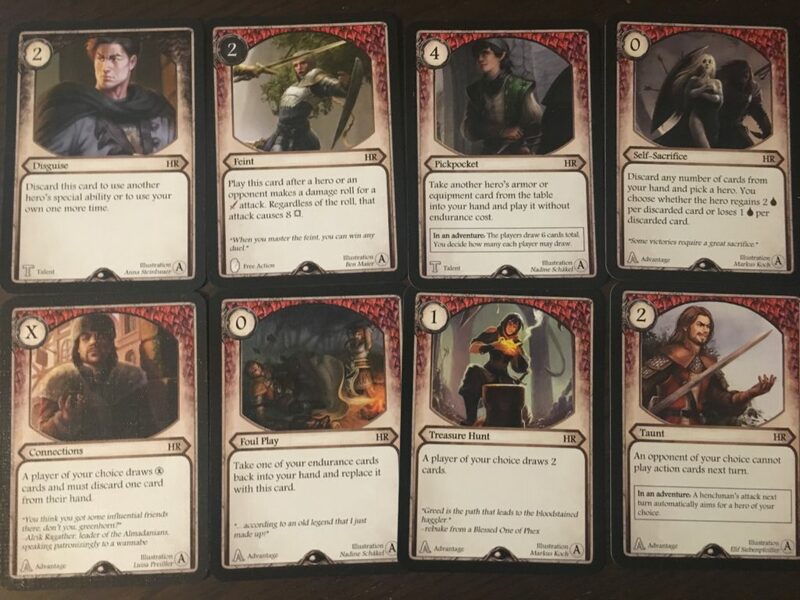 I own a copy of arsenal of heroes so I’m currently using the deck you have listed here. So I’ll add in a second copy of disguise along with connections. What do you think of Suddenly Gone? That seems like a killer move he could use to bypass enemy protection? Looking through some of my cards now. What do you think about cards like Danger Sense, Bad Luck, or Treasure Hunt? Lastly can Self-Sacrifice be played on yourself or is it mainly used to heal another hero?